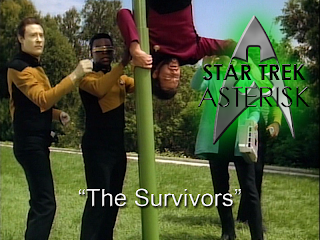 Star Trek: Asterisk "The Survivors"
The Enterprise finds a couple of survivors from a human colony that was destroyed by raiders... or are they?! Following another distress signal, the Enterprise comes upon Delta Rana IV where there is supposed to be a huge human settlement, but when they get there, they find every acre of land has been obliterated. Well... not every acre. A small patch of green land with a house on it appears on sensors amid a world full of devastation. So they send an away team to check it out and immediately Riker ends up upside down in a homemade trap with a rifle pointed in his direction in the hands of Kevin Uxbridge. Looks like it's time for the house tour. Kevin and his wife, Rishon, show the away team around and Data becomes particularly interested in a music box. Rishon says it was passed down to her through generations. But it can also, apparently, play its music in a loop in Counselor Troi's head all the way back on the Enterprise. Not only is the song stuck in her head, but it seems to be really painful and blocking all of her other extrasensory perception. Back on the planet, Riker tries to convince Kevin and Rishon to come back with them, but they refuse. Apparently, it's just fine with them to be stuck in a small patch of land surrounded by hell. Suddenly, a ship appears in orbit after the away team beams back up. The Enterprise engages it to protect the survivors and it runs away. The Enterprise runs after it, but after a while, Picard suspects something else is afoot, so he turns around. When they get back to the planet, he beams down to Kevin and Rishon with a matter replicator. Kevin says they don't need it, but Rishon has other plans. She invites Picard and Worf inside for tea. Which is rather amusing in itself... Worf drinking tea. Kevin and Rishon claim not to have any idea why they were spared among the whole colony. Picard insists there must have been something different about them. Kevin says that there was something different about him. He refused to kill. He never joined the resistance against the raiders that attacked. When they get back to the planet for the final time, Picard startles Kevin and Rishon in the middle of dancing a waltz. They apparently never thought they'd see Picard again. Because fighting alien ships always scare away Federation starships, right? After Kevin demands that Picard just leave them alone, Picard promises not to return to the surface, but the Enterprise will remain in orbit for as long as they are alive. And thus the trap is set. Picard returns to the ship and waits. Like clockwork, the enemy ship arrives and heads straight for the Enterprise... at first. Then it turns and heads toward the planet. It takes aim at the little patch of green land and fires. For all intents and purposes, it appears Kevin and Rishon are dead. 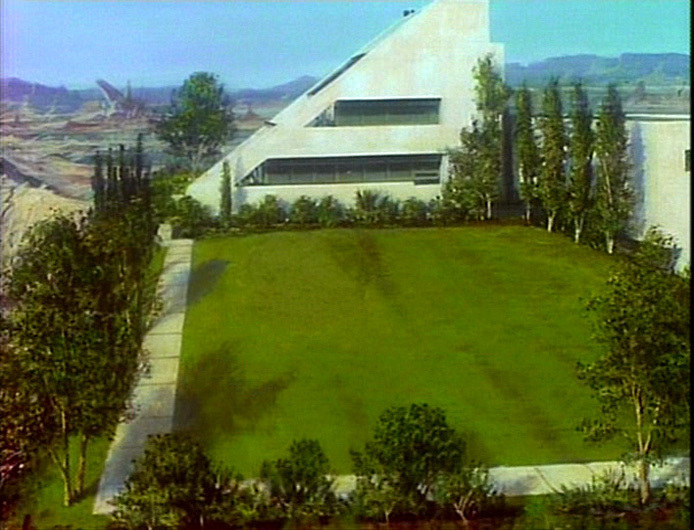 Picard orders the Enterprise to move away just far enough, but not to leave. They keep watch over the planet for a while, and after a few hours... the patch of land returns. Picard then orders a transporter lock on Kevin and Rishon and transports them directly to the bridge where Picard forces Kevin to explain what's really going on. Turns out Kevin has been creating and recreating everything that everyone saw down on the planet with the power of his mind. He's not actually human. He's an immortal being who fell in love with Rishon, made himself human, joined her colony and then watched as she died fighting the raiders who destroyed the colony. Crippled by grief, he recreated Rishon and his home so he could just live the rest of his life happily. It also turns out that he was responsible for the music in Troi's head, because her psychic perception was the only thing that could have figured him out. That's not all, though. After the raiders killed Rishon, he was angry. Really angry. This man who had never killed another being in his entire life, murdered the raiders' entire species. He committed xenocide for the sake of love, and for this he was racked with guilt. After admitting this, Picard admits that they have no law for the scope of his crime. He lets Kevin live the rest of his life back on the planet with a recreated Rishon. 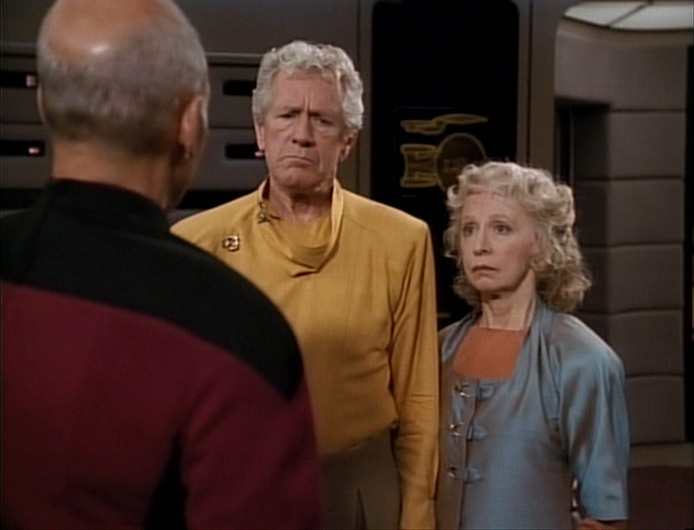 As Picard departs, he notes that Kevin should just be left alone. This turned out to be either really beautiful or really corny. I lean more toward the beautiful, but I can see where some might find it weird that this immortal being was so devastated by the loss of someone he had known for only a tiny fraction of his life. But that's love, isn't it? It smacks you in the face when you least expect it and leaves a lasting mark. So, all-in-all, I give this episode a thumbs up of approval.